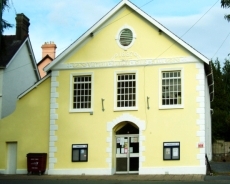 Once the capital of Medieval Wales, Llandeilo is situated in the beautiful Towy Valley. With its boutique style shops, beautiful walks and historic castles it has become a jewel in in the crown of Carmarthenshire. Built prior to 1900 as a drill Hall and Armoury, the Civic Hall has undergone many changes and is about to have a major facelift to many of its facilities, including disabled toilets and new sound and lighting system. The main hall seats 200, and the small gallery upstairs 24. There is a public car park next to the hall. 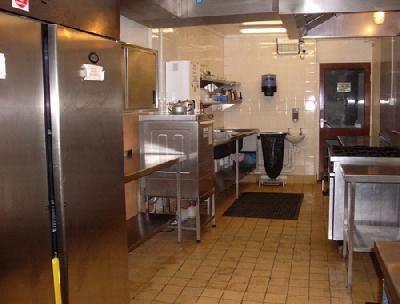 The hall has wheelchair access by prior arrangement, and there will be an accessible WC from February 2010. 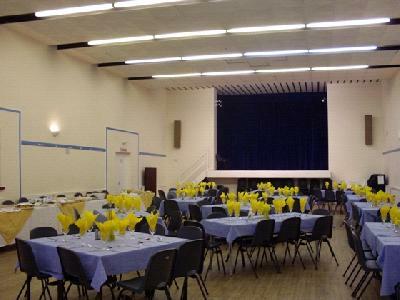 The hall has a good stage with adjoining dressing rooms, fully equipped sound system, CD player and lighting. There will also be a computer with broadband available. The hall has a projector and drop-down screen. The hall and gallery are fully heated and the kitchen has very good catering facilities with a six section bain-marie, large cooker, microwave and catering refrigerator, crockery and cutlery. The Gallery has tea making facilities and its own toilets making it an ideal venue for meetings and small exhibitions. Approaching Llandeilo from the bridge end proceed through the town to the C.K. 's cross roads and turn right – the hall is about 200 yards down on the left hand side. From the A40 roundabout end, proceed through the town to the C.K's crossroads and turn left, the hall is 200 yards down on the left.